Californians rank making health care more affordable among their top overall priorities for the state’s new governor and legislature, with 45 percent citing it as “extremely important,” just behind improving public education (48%) and ahead of affordable housing (40%), finds a new KFF (Kaiser Family Foundation)/California Health Care Foundation poll examining state health policy issues. Among health issues, Californians’ top priorities are ensuring people with mental health problems can get treatment (49% say it is “extremely important”), making sure all Californians have access to health coverage (45%), and reducing what people pay for their health care (41%). Mental health access ranks in the top two health priorities for Democrats, Republicans and independents alike. 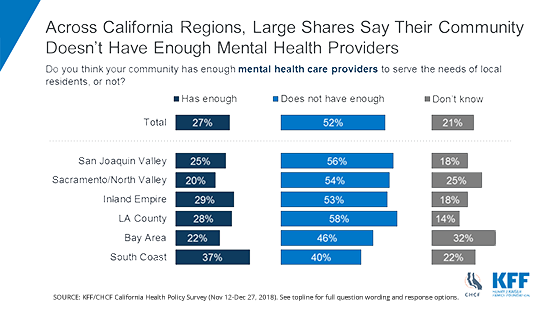 Half (52%) of all Californians say their community does not have enough mental health providers to serve local needs. “We have never before seen the public place such strong emphasis on access to mental health treatment in our national or state polls,” said KFF’s President and CEO Drew Altman. The poll also gauges Californians’ views on the Medi-Cal program and finds an overwhelming majority (91%) say Medi-Cal is “very” or “somewhat” important to the state, including large majorities of Democrats (97%), independents (90%), and Republicans (80%). About six in 10 Californians (59%) say Medi-Cal is personally important to them and their families. More than four in 10 Californians (44%) say they or someone in their household delayed or skipped medical care in the past year because of the cost. The share rises to more than half for people who are uninsured (54%) as well as those with incomes below 200% of the federal poverty level (55%). One in five (20%) say they have had problems paying household medical bills in the past year. The share is higher among those who suffer from a debilitating health condition (34%). Worries about affording unexpected medical bills (63%) outrank worries about affording routine out-of-pocket medical costs (56%) and worries about affording other basic needs, including transportation (53%) and housing (52%). Most Californians (57%) say residents with mental health conditions are not able to get needed services, and nearly half (48%) say the same about people with alcohol and drug use problems. The share reporting lack of access is even higher among those who say they or a family member sought treatment for these problems in the past 12 months. Nearly a quarter (23%) of Californians say they had to wait longer than they thought reasonable to get an appointment for medical care in the past 12 months. This includes one in three (33%) Medi-Cal enrollees. Among those who say they or a family member sought treatment for a mental health condition in the past year, about a quarter (23%) say they had to wait longer than they thought reasonable to get an appointment for mental health care, a share rising to four in ten (42%) for Medi-Cal enrollees. In addition to half of Californians citing a shortage of mental health providers, about a third say their communities don’t have enough primary care doctors (35%) or specialists (33%) to serve local residents, and a quarter say they don’t have enough hospitals (27%). People living in the San Joaquin Valley and the Inland Empire are more likely than other Californians to say their local community lacks adequate numbers of providers. The poll finds Californians strongly support one potential idea for addressing regional provider shortages: a large majority (83%) say the state government should provide medical and nursing students with scholarships and financial help if they agree to work in areas with too few providers. Half (50%) of the uninsured in California say they have been without insurance for at least two years. The main reason people report for being uninsured is that insurance is too expensive or they cannot afford it. Worries about immigration status may also contribute to some uninsured Californians’ reluctance to seek coverage. Among the uninsured, 40 percent say they are worried that signing up for insurance could draw attention to their or a family member’s immigration status. Although ensuring access to insurance is a top priority for Californians, residents hold mixed views on establishing a single-payer health system in the state. About half the public (48%) favors such a plan, while four in 10 (40%) oppose it. Notably, six in ten California Republicans (62%) strongly oppose such a plan, while about half as many Democrats (32%) strongly support it. Most Californians (58%) view the Affordable Care Act favorably, making the national health reform law somewhat more popular in California than the country as a whole. This may be largely due to the fact that California leans Democrat, and Democrats are more supportive of the law than independents or Republicans. Most Californians (56%) also say the state-run health insurance marketplace, Covered California, is working well. This includes majorities of Democrats (70%) and independents (55%), but only a third of Republicans (34%). Designed and analyzed by researchers at KFF and the California Health Care Foundation, the California Health Policy Survey was conducted from November 12-December 27, 2018 among a random digit dial telephone sample of 1,404 adults living in California. Interviews were conducted in English and Spanish by landline (476) and cell phone (928). The margin of sampling error including the design effect for the full sample is plus or minus 3 percentage points. For results based on subgroups, the margin of sampling error may be higher.